Choose from 13 Birthstone Colors!! Hard to find 45mm Fiber Optic, Cat's Eye Hearts. These stunning Cat's Eye crystal 1" thick puffy hearts are available in 13 vibrant colors and can be used as Feng Shui tools to clear negative energy and increase the positive Chi energy in dark rooms and corners. 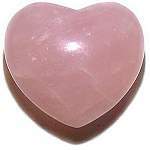 Enjoy the beauty and gentleness of rose quartz. 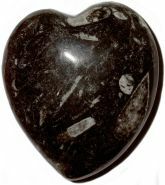 Called the Lover's Stone, it can be used to radiate the soothing love energies in your home or office. Beautifully polished 45mm or 1 3/4" puffy heart shaped gem stone. Onyx is part of the Chalcedony family which includes Quartz, Jasper, Agate and more. The power stone Black Onyx has been used to banish grief and encourage happiness and good fortune. It bolsters those who have to face obstacles alone. Beautifully polished puffy heart shaped 45mm or 1 3/4" wide gem stone. Iridescent Opalite 45mm Puff Hearts shimmer with rainbow colors like Opal. Opalite is a man made stone made from natural Calcite and can be used as Feng Shui tools to clear negative energy and increase the positive Chi energy in dark rooms and corners. Selenite grows in long "cat's eye" translucent pearl white crystals and is a form of Alabaster. It is said to be a powerful cleanser of negative energies, even clearing quartz crystals. Selenite resembles the light of the full moon and is a natural cat's eye stone as opposed to the man-made fiber optic varieties. Beautifully polished 45mm or 1 3/4" and 2" wide puffy heart gem stones. We now have pocket size 35mm puff Shungite Hearts from Russia with an excellent satin leather like finish. Russians have used Shungite and Shungite waters for their powerful healing and purification properties since Peter 1st. Shungite contains Fullerene molecules that display mysterious quantum bi-location and molecular nano programming properties. 1 3/8" W x 3/4" D - Velvet pouch included. Moroccan Orthoceras are nautical cephalopod fossils that formed in the Ordovician Period about 400 million years ago. Fossilized Orthoceras have elongated rocket or cylindrical spear shapes. This unique free form Orthoceras heart was hand carved and polished in Morocco is extra thick with a velvet pouch included. Rare 55mm extra thick Puff Petrified Wood hearts from Madagascar with small druzy geodes are bursting with fantastic colors and patterns that only Nature can conceive. It is a Bio-Gem, like Amber or Coral. The wood is replaced by deposits of Agate, Quartz or Opal and other mineral crystals. Petrified Wood has a metamorphosis from a biological life cycle to a millennial earth cycle. It symbolizes union with earth rhythms, historic legacy and time cycles. Fabulous and rare "Gold" Pyrite geode 50mm Jumbo Puffy hearts from Peru are masterfully polished to expose the natural crystal geodes growing in the stone. Pyrite, well known as fool's gold, is a polymorph of Marcasite. It is said to be a very potent protector, shielding one from intense negative energies. 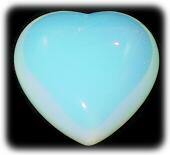 Beautiful, high shine polished 2" puffy heart with velvet pouch included. Superb quality Iron Pyrite geode 55mm puff carved hearts from Peru are superb examples of the natural crystal geodes growing in the stone. Pyrite, well known as fool's gold, is said to be a very potent protector, shielding one from intense negative energies. Superb high shine 2 1/4" puffy heart shaped carving with velvet pouch included. Rare Rhodochrosite Hearts from Peru have striated pink crystal formations Gold Pyrite and Black Tourmaline inclusions. Rhodochrosite is considered to be a most powerful spiritual stone, it assists one to tap into the energy of Universal Love, the ultimate unifier and integrator. According to Gem Lore it also encourages optimum mental and physical health and healing. Beautifully polished 50mm or 2" and larger puffy heart shaped gemstone with its own velvet pouch. Gorgeous Rhodonite hearts have a pink matrix that are veined delicately in black with tree like formations of manganese oxide. Rhodonite is said to balance the yin-yang energies and assist in the attainment of one's greatest potential. 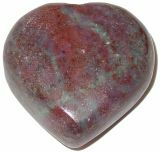 Beautifully polished 45mm or 1 3/4" puffy heart gem stone. A beautiful combination of Emerald Fuchsite, Ruby and Blue Kyanite puffy hearts from India. The Ruby crystals have a wonderful sparkle surrounded by Blue Kyanite in Emerald Fuchsite. Kyanite does not hold negative energy and assists in cleansing other crystals. Ruby encourages the search of one's Bliss and lights the darkness within the spirit. Fuchsite is said to increase the healing properties and flow of energy from other healing crystals. Rare Ruby Fuchsite 45mm or 1 3/4" and larger puffy heart shaped gemstone. AA Septarian 60mm Hearts from Madagascar are hand carved and polished. Septarian nodules originated millions of years ago when Aragonite and Yellow Calcite filled cracks in shale and dead shells to form ornamental veins and crystals in porous stone. These Septarian hearts, also called Dragon Stone come in a decorative velvet pouch. AA Septarian 60mm & 65mm Geode Hearts from Madagascar are masterfully polished to expose the natural crystal geodes growing in the stone. Septarian nodules originated millions of years ago when Aragonite and Yellow Calcite filled cracks in shale and dead shells to form ornamental veins and crystals in porous stone. 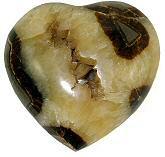 These Septarian hearts, also called Dragon Stone come in a decorative velvet pouch. 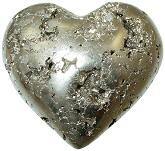 Superb Iron Pyrite Hearts have an amazing shiny gold polish. In crystal lore Iron Pyrite is a potent protector, shielding one from intense negative energies while maintaining a positive and optimistic outlook. 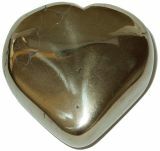 Each free form polished 45mm or 1 3/4" puff heart is unique and has smooth flat 3/4' H sides. Rare Ruby Hearts from India are intergrown with blue Kyanite crystals and also known as Ruby Rock. In Gem lore, Ruby is known as "The Stone of Nobility", it encourages the search for one's Bliss, protects from unhappiness and lights the darkness within the spirit. 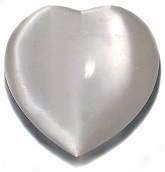 Each free form polished 45mm or 1 3/4" puff heart is unique smooth flat 1' H sides.